I mentioned the other day that Briarwood, the government-subsidized housing complex where I lived, had what residents and folks running the place called a “craft-room.” Actually, there were 4 craft rooms, one in each building, second floor, across from the elevator. These “craft rooms” were more like little libraries with couches, a few comfortable and very 80s-era blue chairs, an artificial flower or two, and, yes, an equally-80s-styled book-case that housed at least 6 dozen romance novels and a few Chicken Soup for the Soul anthologies—not to mention a good 30 games and close to 50 jig-saw puzzles—all with pieces missing, of course—because what’s a puzzle without a few holes in the Eifel Tower image—Monet’s “Water Lilies” minus a bloom or two? In Building A, where I lived, the elderly, lady residents gathered in the craft room most afternoons—gossiping, reading, gossiping some more. Some slept from time to time. A few even snored. Mind you, no one assembled there was born after 1920—except for me, of course, D.O.B. 1962. Yes, I know—generation gap—big time. 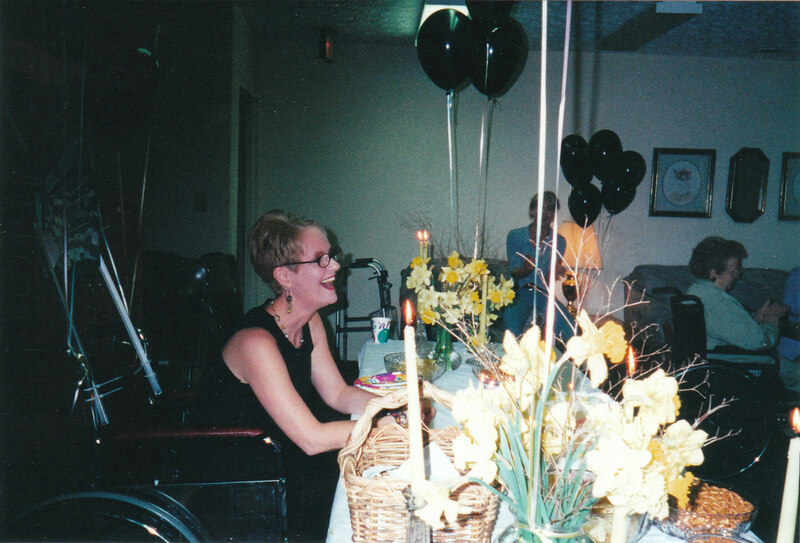 On my 40th birthday Briarwood friends sat me in a wheelchair to mark the occasion of my aging. Note: I didn't wear a wig. Wigs were all the rage in the craft room. And everyone, besides me in my sweatpants, dressed up. One woman named Evelyn—92-years-old when I moved into the complex—always wore a wig. And she was the best dressed of the group—nicely-styled polyester dresses in navy or gray, with crisp white collars and big brass buttons—usually a fake patent leather belt around the waist. Evelyn engaged in the only remotely craft-like activity ever done in the history of Briarwood craft rooms. Evelyn crocheted. And she ever only made one thing—over and over. She had to have produced hundreds, even thousands, of them while I lived there. Evelyn made doilies. Usually they were white. Sometimes they were lavender or baby blue, some coaster-sized, others larger. Bottom line—Evelyn may have doilied me to death, but believe you me, every gray-haired lady in Building A was as well-doilied as me. When I finally moved from Briarwood in 2005, I found more coaster-sized, crocheted circles and almost circles (as Evelyn aged) shoved in underwear drawers and kitchen cabinets than any self-respecting resident of government housing ought to own. But our dear friend Bea, on whom I tried to foist doilies from time to time—also frequented the craft room. Bea, tall and painfully thin, had to have been at least 5’ 9” before osteoporosis and old age shrunk and hunched her to a mere 5’ 6”, and she couldn’t have weighed more than 70 pounds fully dressed and soaking wet. Bea, like Evelyn, had obviously, at one time, been a stunningly beautiful woman, a fact betrayed by facial features that shown through despite her age—high cheek bones and big, blue eyes that still twinkled when she smiled. Bea was one of the few ladies in the group who didn’t wear a wig, and for a woman well into her 90s she had a head of gorgeous, light brown curls. True her hair was largely gray, but she retained enough of the brown to surprise you, since otherwise she looked so old and borderline antique. Bea was also one of the ladies who slept most afternoons, waking herself up every few minutes with her own overly-sized snores. But then again, Bea never stayed more than 30 minutes at a time, as when nicotine called at least twice an hour, she struggled to her feet from the over-stuffed chair, shuffled her pink-slippered feet across the industrial blue carpet, and disappeared into her apartment several doors down, only to reemerge a few minutes later having snuck a cigarette or two, still insisting upon her return that she had had to use the rest room or make a phone call. Never mind she smelled like smoke over the tic-tac she sucked and the Avon she had sprayed post-puff. But what’s the point of these craft room portraits? Why share these old lady images, besides the fact that these grand dames of Briarwood charmed the socks off the too-few men in the building, like sweet Wayne, who, at 60-something, visited the craft several times a week? These aging ladies utterly obliterate the image most folks have of government-subsidized housing. These were not crack heads with jeans belted around their knees or welfare moms, screaming, runny-nosed toddlers on either hip. These were not delinquent teens smoking pot in parking lots or dangling younger siblings from balconies. These ladies were what 90% of the residents at Briarwood were like, kind, considerate, doily-crocheting grandmas who cared about me and the other neighbors they encountered in the elevator or the wanna-be craft room on the second floor. These ladies were also, in many ways, the story of my recovery. Though I never breathed a word to them about bipolar disorder, what they would have called “a problem with [my] nerves.” These ladies loved me and asked nothing more than that I allow them to lavish their doily-making attention on me. But then that’s a subject for another post—the tale of just how these women worked a psychiatric magic, a mental health miracle, how they did what drugs and doctors failed to do, allow me to leave government housing in 2005 only to become a home-owner in 2006. So stay tuned over the next several weeks, as I bring you more up-close-and-personal encounters with well-wigged old women, more doilied-adventures in government-subsidized housing. This entry was posted in aging, community, home, memoir, mental health and tagged aging, bipolar disorder, Briarwood Apartments, doilies, government-subsidized housing, health, home, home-ownership, housing, inspiration, life, mental health, postaweek2011, poverty, recovery, Section 8, senior citizens, wigs. Bookmark the permalink. I know! It’s funny–isn’t it? And, of course, I exaggerate a bit. I probably didn’t have a totally outrageous number of doilies, but I remember it being a semi-issue. What in God’s name does one do with these damn dloilies?! Indeed this was written so very well…that I too felt like I had entered the room and sat down to have a conversation with them. Thanks for reading, Charles! Glad you felt like you were there! They were such lovely women! Kathy, you had me right there with you also. Great story! I look forward to the next part. Cool–glad the story put you there in that room! And how fun that you are looking forward to reading more. Now I better get writing! Thanks Marianne! What a treat to get to know Evelyn and Bea through your words. Makes me sad to realize how often the elderly are overlooked and ignored instead of being recognized for the wonderful human beings that they are. It is sad! Especially since so many elderly folks have so much to offer! Mostly they have time and they have love–the two things that matter most! I’m glad you got to meet these ladies! Thankks so much for reading! I love this post. I love it. I love it . I love it. I love it, love it, love it that you love it! Ha, ha! I’m so pleased you enjoyed this one, Tori! I actually like this piece too. It was fun to write! Ah, Kathy, I want to read a book about Briarwood and the ladies. I want to read a book about their wigs and their words and their ways. I want to read about how when we come from no preconceived notions, we can create the impossible. Yes, I think these ladies definitely deserve a book! How wonderful that you would want to read! Isn’t it amazing what just a little love can accomplish! Thanks so much, Renee! I often wonder if young people ever crochet doilies anymore. It was this very issue that kept me awake last night! No wonder have insomnia–damn doilies! What a lovely observation of well life really – that these women touched you and as you say were able to do what doctors and drugs couldn’t do. When we boil everything down this is what really matters in life, the people we meet and connect with. Really lovely post Kathy. I’m so pleased that you appreciated this post, Penny! Life really is about people–and love–and what we share with one another! Thanks so much for reading! Hope you have a great weekend! Great descriptions of true characters. I can picture them all. I love how detailed you get to bring these women to life, and the honor and love that each word reveals. Great writing, Kathy! Another wonderful addition to your amazing story. Oh, wow, Lisa, thank you! Please be sure to visit my post from today (Sunday) as I created an award for you. (It’s not the most magnificent looking award, but it is from the heart). But it is a magnificent looking award! You are dear to notice my use of detail! Thanks, my friend! Thanks, Mark! That’s a huge compliment coming from someone who writes as well as you do! Master of imagery comes to mind. I feel as if I have met those people. Thanks for sharing as always!! I really enjoyed this piece, Kathy…you’re a keen observer of people…looking forward to more! I’m embarrassed to admit I didn’t keep them. They were sweet but terribly tacky. Does that mean I’m not a hoarder?! This might be evidence I can share with Sara! Glad you enjoyed this post. Hope you have a great weekend, Wendy!